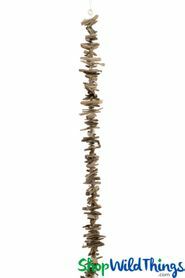 Our driftwood garlands are made of hundreds of pieces of natural wood. They are beautiful to hang, to wind around a tabletop, to place on the mantle and more. You might even swag it over top of curtains, off of ledges, or around a stairwell! Make your own beaded curtain in a window by hanging some next to each other. There are so many great uses for these beautiful, natural elements. We feel that these would work well with modern, rustic, natural Decor as well as with your cottage or beach-home look. Having a wedding on the beach? 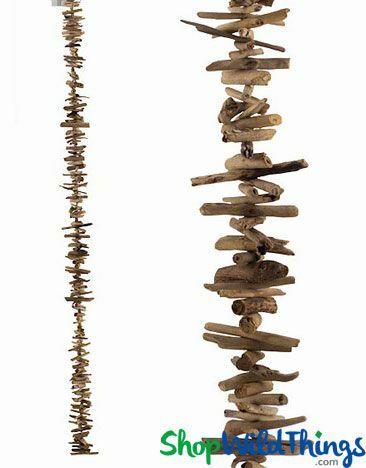 Use our driftwood garland strung along stands to create unique aisles! Each strand is 72" in length and the pieces of wood are approx. 4" long each. Strung on heavy twine, there is a loop on one end for easy hanging. I was looking for exactly what I received from this shop - good price, shipped timely, packed well, arrived in perfect condition! 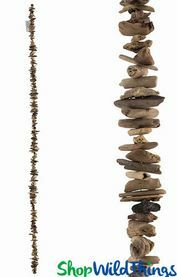 Driftwood garland is lovely, varied shapes and sizes, overall 4" widest, nicely made. If this is what you're looking for, get it! A really neat way to add a beachy look to your home. I hung mine from a corner of the living room and used my glue gun to add a few small starfish and shells. Looks great ! Ordering is easy and delivery quick. ProsSturdy and neat with loop from which to hang. Add your own decorations or leave as is.